Happy Monday everyone! China Glaze has put out a twelve piece holiday collection for 2015 called Cheers! 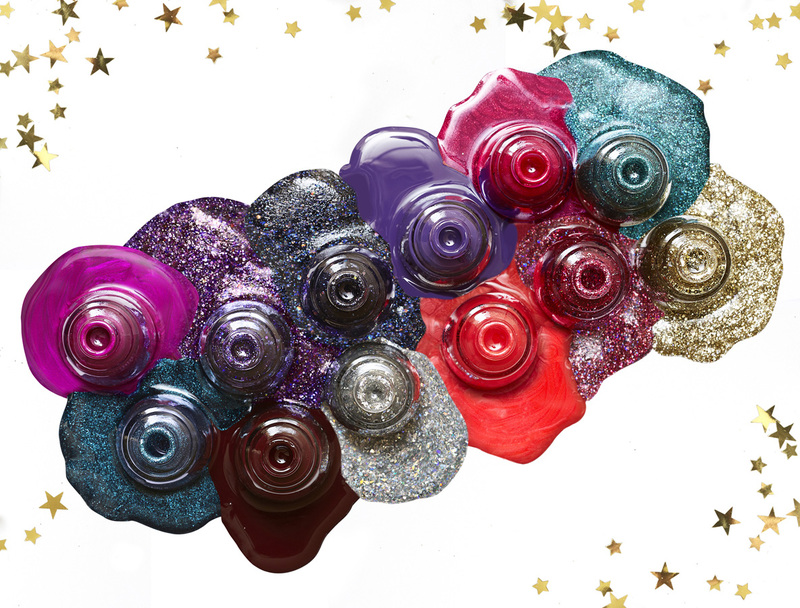 This collection is filled with festive colors perfect for creating party-ready manicures! Or even if you're a homebody like me, you can still enjoy your holiday nails in the comfort of your own home haha. Don't Get Elfed Up has a black jelly base filled with large metallic shimmer bits in deep teal that has a slight duochrome to blue and purple. This applied a little sheer on the first coat but build up on itself nicely in only two coats. This is the type of China Glaze polish that give me heart flutters, such an excellent shade! Ugly Sweater Party is a pinky-red jelly with tons of metallic and holographic hex glitters in varying sizes in silver, purple, and pink. This had a good formula. It was a little thick but not as much as the other two jelly glitters in this collection. A little light on coverage though, this is three coats. You will need a thick top coat to smooth out the glitters in this. I didn't know if I would dig this at first glance, but I really like it! Mix And Mingle is a warm purple. The consistency of this one is somewhere between a crème and a jelly; it was thin and unfortunately runny. This is three coats. It dried very shiny and is a lovely color, but I bet there is something similar in the China Glaze line that has a better formula. You can see on the side of my nail where it's sheerer than the other because of the runny consistency. Coal Hands, Warm Heart is a black jelly with medium holographic silver hex glitters, smaller indigo metallic hexes and a sprinkle of silver bits. This one was quite tricky to apply. I found it very thick but runny at the same time. It needed three coats and it was bumpy and lumpy looking. I needed two coats of thick top coat to make it smooth. I would definitely layer this over an opaque black crème if I wore it again. Wine Down For What? is a muted deep wine red crème. Good formula, a tiny bit runny but not as bad as the purple. I needed three coats for full coverage. This is also very shiny! I am loving this shade lately and the shade name cracks me up. Brand Sparkin' New Year has a purple jelly base packed to the brim with holographic and metallic glitters in large, medium and small sizes. Talk about a party in a bottle! I love the finished look of this but found the formula thick and gummy. I had to dab it on in places to get it to apply evenly. This is two coats with a thick layer of top coat. Son Of A Nutcracker is a orangey pinky vibrant red shimmer with a pearlized finish. I wasn't sure what to think of this from pictures, but when I saw it in real life I actually really like it. Seems much more orange indoors than out in bright light. This had a thin consistency and was a touch brushstrokey, but definitely not terrible. Three coats. Break The Ice is a super cool holographic silver shard glitter in a clear base. I was blown away by the look of this baby in the bottle. I've been wanting something like this for a while now. I layered it over Mix and Mingle. This is very heavy on the base so I got minimal flakes out on the first layer. I went in with a heavier hand for another and ended up with a lot of clear base on my nail, which bubbled. I might try to sponge this on the next time I wear it, I hear the sponge helps absorb some of the liquid to get a nicer result. Peppermint To Be is a pretty holiday red shimmer. This has a sprinkle of glistening glass fleck shimmer bits in it which really pumps up the wow factor. A lovely formula, one of the best in the collection. Two coats here. Bring On The Bubbly is mix of various sizes of bright metallic and holographic light gold hex glitters in a clear base. I layered one coat over Wine Down For What? and it had excellent glitter payoff. The base seemed very thin and a little runny, but other than that I didn't have an issue with this. I love the combo of these polishes, perfect for the holiday season! I Soirée I Didn't Do It is a blue-green glitter in a slightly tinted teal base. I thought this would build up easily but it really didn't. Pretty sparse because of the thin formula. This is three coats and you can still see the spots without glitter around the edges. Another one I would layer over an opaque color next time. Better Not Pout is a vivid berry magenta lustrous pearl. Comes off a little metallic but without super noticeable brushstrokes, unless you overload your brush. Another one that was on the runny side. This is two coats. You can pick these up now at your local Sally Beauty Supply or Ulta store. They are also sold online at various retailers. Tell me what you think about these party worthy colors! My favorite has to be Don't Get Elfed Up, followed by Son Of A Nutcracker and Ugly Sweater Party. I think I would've like most of the colors more if they had better formulas though. Are you picking any up of these for the holidays? Do you have any special holiday parties to go to this year?